High Availability (HA) for Cloud Databases means that Cloud Databases users can run their critical production workloads without worrying about a database becoming unavailable due to the failure of a database component. It improves the reliability of running a database in the cloud environment by minimizing downtime and ensuring that the application is never down for more than a few seconds in the event of a failure. A Cloud Databases HA instance group includes a source database instance and one or two replicas. For a robust HA setup, we recommend two replicas. If the source database instance becomes unavailable, an automatic failover is initiated to one of the replicas. The automatic failover and promotion of the new replica is completed in approximately 10 to 30 seconds. We currently support HA for MySQL 5.6, Percona 5.6, MariaDB 10, and later versions. For critical application workloads, a couple of minutes of application downtime can result in significant revenue losses. Users can implement Cloud Databases HA instances to ensure that their databases are highly available, and only experience a small amount of downtime in the event of failover. To reduce the load on the source instance and improve performance for read-heavy workloads, Cloud Databases users can redirect writes and reads to source and replica instances within the HA setup, respectively. Note: Your application must be able to direct the reads and writes to a specific port. HA for Cloud Databases relies on Master High Availability (MHA) for MySQL functionality for source monitoring, automatic failover, and replica promotion. The replication setup is semi-synchronous and involves one source and one or two replicas. MySQL and Percona implementations are set up by using global transaction identifiers (GTIDs). To improve the robustness of the system, the source and the replicas are each provisioned on separate hosts. An HAProxy load balancer controls a single access point (IP/hostname) for the HA group and uses different ports for the read-write pool (port 3306) and the read-only pool (port 3307). The load balancer with HAProxy is highly available itself, with two nodes managed by Keepalived. It is accessed by using a virtual IP (VIP). Figure 1 provides an overview of a Cloud Databases HA setup. The MHA Manager lives within the source HAProxy node and monitors the source database instance. If the source database instance becomes unavailable, MHA initiates failover to the most up-to-date replica instance. All of the other replica instances automatically reattach themselves to the new source. If some of the replicas do not receive the latest relay log events, MHA automatically identifies differential relay log events from the latest replica and applies them to the other replicas. MHA also triggers a script that switches the new source out of the read-only pool and updates the write pool. The total process takes approximately 10 to 30 seconds. You can create new HA instance groups and convert from a replica set to an HA group by using the Cloud Control Panel and the API. For more information about HA-related API calls, see the Cloud Databases Developer Guide. By default, access to an HA instance through the VIP is blocked. To access an HA instance, you must explicitly add an access control list (ACL) that specifies the IP addresses to which to grant access. You can set ACLs through the API or the Cloud Control Panel. The networks property that is associated with an HA instance provides the addresses and ports for accessing the HA instance. (You can obtain this property by listing the details of an HA instance.) The single access point, or VIP, of the HA instance is specified as the address. All of the reads and writes that are directed to the VIP and port 3306 are sent to the source instance. You can also direct reads to replicas by using port 3307. On HA groups, most service actions (such as resize and configuration, for example) must be applied to the universally unique identifier (UUID) for the HA group rather than the individual database instances within the cluster. 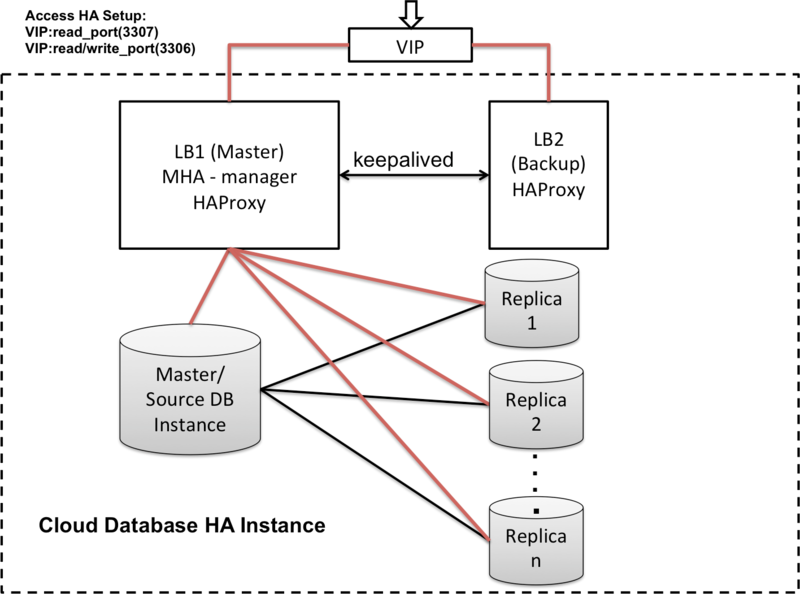 The only operations that are allowed on instances that are part of the HA group are create users and create databases (on the source instance). All other operations are blocked on the instances. If a failure occurs, an automatic failover to the replica that is closest to the failed database instance takes place. Cloud Databases removes the failed database instance. A new replica that has the same flavor and volume as the other instances that are part of the HA group is built and automatically added to this setup in order to maintain the HA node configuration. While this replica is being added, the HA is in the ADDING_REPLICA state. It switches to the ACTIVE state after the node has been successfully added. Warning: Automatically adding a new replica restarts the MHA Manager service and the HAproxy service on the load balancer nodes. Any API actions that are issued to the cluster during the replica add part of the process might not succeed. Create an HA setup with two replicas. This architecture guarantees a highly available setup, even post-failover. Monitor and set up alarms for the replicas to ensure that they are in a healthy state. For more information about monitoring replicas, see Database replication with Cloud Databases. The maximum number of replicas allowed per source database instance is two. HA instances are available only for instance flavors that are 1 GB or greater in size. The source and replicas must have the same size and flavor. The source and replicas are created in the same region. Backup, resize, and custom configuration commands and changes must be applied to the overall HA group by using the group UUID. Applying updates across groups ensures that all of the instances in the group have the same configuration. Backup commands select the most up-to-date replica and create a backup from it. Backup, resize, and custom configuration commands and changes against the individual instances in an HA group are not allowed. Note: When you add a replica for a MariaDB HA group, you cannot use an existing replica to generate a snapshot for the new replica. For more information, see Xtrabackup doesn’t log master co-ordinates while backup up MariaDB 10. There is a small delay between the source and the replicas. Ensure that all reads that require strong data consistency are made to the source instance (port 3306). Initial setup of the HA group might take anywhere between 5 and 10 minutes, depending on the number of replicas. Because the initial setup requires creation of multiple nodes, allow some time for the status property of the HA instance to display as ACTIVE when you perform a GET call through the API. The instance listing in the Cloud Control Panel shows the status of the HA group. To take action on the cluster or view cluster-level information, click the instance name to go to the HA Group Details page.